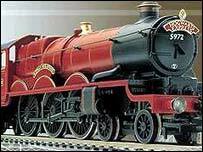 Harry Potter and the Simpsons have helped push up sales at model maker Hornby. The makers of model railways and Scalextric racing cars saw profits rise 45% to £5.4m in the last year. The figure was boosted by sales of it Hogwarts Express train - a model of the steam engine in the Harry Potter books - and a new range of Scalextric cars based on characters from the Simpsons cartoon. Sales of its more traditional model trains also rose, and, along with strong overseas sales of Scalextric, helped fuel a 20% rise in turnover to £34.1m. The company has had success with its tie-ins to popular film and television characters. It has just signed a deal to make a Scalextric kit based on the film The Italian Job. It has also kept its model range up to date with replicas of Eurostar and Virgin trains. Chief executive Frank Martin said: "Sales of both the Hornby and Scalextric product ranges are exceeding our expectations." Mr Martin said producing the Hogwarts trains to tie in with the recent films had helped attract younger enthusiasts to the hobby and the initiative had increased the group's profile as a licensee laying the foundation for the other new products. "Whilst we are working away at building up the hobby side of our business it is important to generate excitement at the younger end," he said. "Harry Potter brought a lot of youngsters into model railways who might not have otherwise had an interest." Mr Martin said Hornby hoped to boost its catalogue by developing a model version of Virgin's new high-speed tilting trains. But he said the traditional Hornby steam trains remained a central part of Hornby's business.